How committed we are to our mission is shown through how devoted we are to assist our clients with respect, care, and compassion. 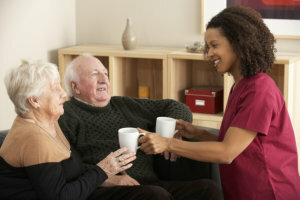 A Friend In Need Home Care is a local, family-owned and operated non-medical home care agency located in Olathe, KS. We specialize in senior care and provide a wide range of personalized solutions to meet the distinct needs of seniors who wish to age in place instead of entering retirement homes or care facilities. Caregiving is a strong commitment and responsibility that we take very seriously. Each case is overseen by a Licensed Registered Nurse. As well, we commit to providing quality care by utilizing experienced and thoroughly screened Certified Nurse Aides to care for your loved one. Our vision is to be the community’s first choice for extended family caregivers. Our mission is to improve the quality of life within the communities we serve. We are committed to delivering competent and reliable home care services that ensure our clients are safe, healthy and smiling. We promote a supportive and collaborative team environment for the families, caregivers, and staff. Trashon Jackson owns and manages the day-to-day operations of the company. Her personal experience as a caregiver for a close relative influenced her decision to serve the aging and disabled community. Being hands-on, Trashon takes a personal interest in all of the clients and her staff. She is committed to providing safe and quality services that give her clients and families peace of mind. We sincerely thank you for taking the time to read “About Us” and hope we prove deserving of your support. Kindly call 913-289-8849 or schedule your Free In-Home assessment online.